It occurred to me the other day that Arthur Conan Doyle invented Sherlock Holmes, one of the great fictional embodiments of the rational deductive method - finding evidence, observation and all the rest of it. 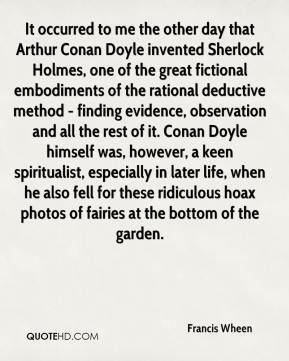 Conan Doyle himself was, however, a keen spiritualist, especially in later life, when he also fell for these ridiculous hoax photos of fairies at the bottom of the garden. This is the bizarre thing. 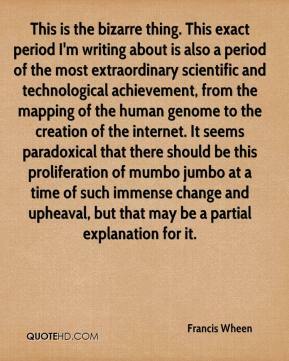 This exact period I'm writing about is also a period of the most extraordinary scientific and technological achievement, from the mapping of the human genome to the creation of the internet. It seems paradoxical that there should be this proliferation of mumbo jumbo at a time of such immense change and upheaval, but that may be a partial explanation for it. 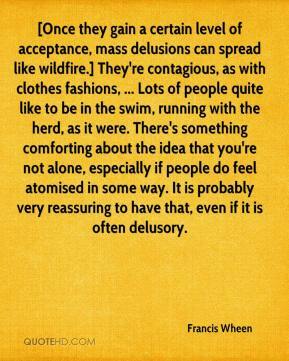 [Once they gain a certain level of acceptance, mass delusions can spread like wildfire.] They're contagious, as with clothes fashions, ... Lots of people quite like to be in the swim, running with the herd, as it were. There's something comforting about the idea that you're not alone, especially if people do feel atomised in some way. It is probably very reassuring to have that, even if it is often delusory.